Our presentation features an educational approach with conservational stories, and an up-close animal encounter that would be a great addition to your birthday party, family reunion, or other special event. The Travelling Zoo is the perfect way to ensure your event or party will be one to remember. Book us today and get ready for an entertaining and educational show that is hands-on and truly interactive. 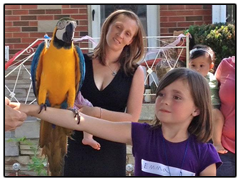 The Travelling Zoo is available for fairs, festivals, school and church events, seniors homes, company and private parties, and much more! We had The Travelling Zoo come to my 8 year old’s birthday party. The girls loved it!! Staff was friendly and great with the kids. I would highly recommend the service. Fill in this form to contact us about bringing the zoo to your next event. Let us know the basic details (who, what, when, and where) and we’ll get back to you with more information. Let us know if you have any questions, too! We use this to reply to you. This helps us prevent spam messages.